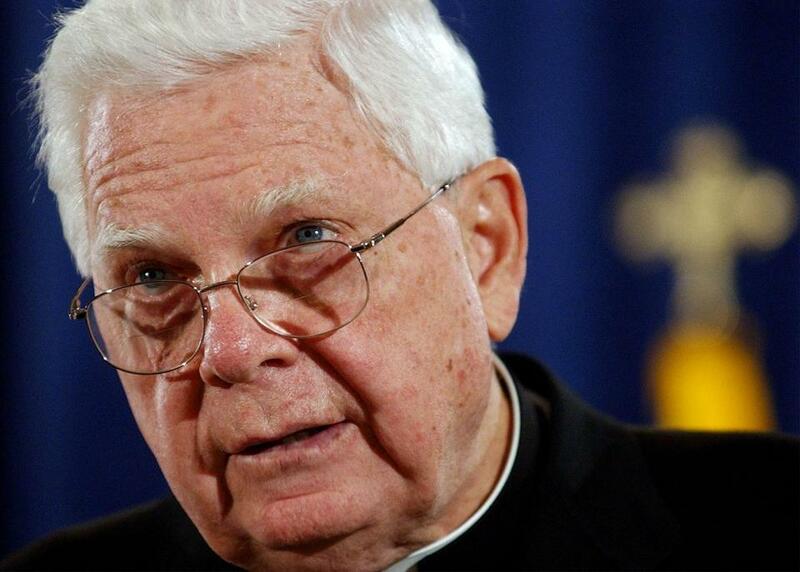 Cardinal Bernard F. Law has to approve any bankruptcy legal steps by the archdiocese. The Archdiocese of Boston is preparing to take the extraordinary step of filing for bankruptcy, as hopes fade for a settlement with an estimated 450 alleged victims of clergy sexual abuse, according to a senior church official and two sources close to the archdiocese. Cardinal Bernard F. Law, who has been involved in discussions about the prospect, has yet to give his approval. But his senior advisers are united in the view that seeking protection in US Bankruptcy Court is preferable to a damaging and costly battle in state courts that might drag on for years, according to the official and the sources. Seeking Chapter 11 bankruptcy protection would be an unprecedented and risk-laden step for the US Catholic church. It would suspend action in civil lawsuits and bar the filing of new suits while the church reorganizes its finances. Legal specialists noted other advantages: It would force the 450 claimants into a single group in the federal court and set a time limit for the filing of new claims. And it would give the federal bankruptcy court wide latitude in overseeing a global settlement. Moving the church’s troubles into bankruptcy court - if negotiations fail - would amount to an admission by the archdiocese that it is liable for the claims because of its negligence, according to one of the church sources. It would also mean that Law would no longer have to answer embarrassing questions in pretrial depositions about his oversight of abusive priests, and his lawyers could stop providing plaintiffs’ lawyers with damaging files about priests. But much of the damage from court-ordered disclosures has already been done. This week, for instance, lawyers for victims will start making public the church’s records on 65 priests who allegedly abused minors. With many Catholics eager to have the victims compensated but others upset that lawyers will receive one-third or more of any settlement, bankruptcy may be an attractive option, since there is recent precedent in bankruptcy court for judges to limit the fees paid to lawyers. One of the cardinal’s advisers, who like the others spoke on condition that they not be identified, said church lawyers remain hopeful there will be an equitable settlement, overseen by mediator Paul R. Sugarman, with about 40 attorneys who represent a list of victims that continues to grow. The attorneys for the victims have until Dec. 16 to provide Sugarman with the size of the damage award that each sexual abuse victim is claiming. Based on recent settlements, according to the estimates of lawyers on both sides, the total of all the claims could exceed $100 million. Robert A. Sherman, an attorney at Greenberg Traurig, which represents about half of the victims, said that it is premature for the church to consider bankruptcy. Before abandoning the mediation process, Sherman said, the archdiocese needs to determine the potential damages it faces, the amount of insurance coverage it has, and its prospects for raising the difference by tapping its own assets. If it opts for Chapter 11 protection, the archdiocese is unlikely to take that step until next month at the earliest, according to the sources. But the church may not find the environment much more to its liking than Suffolk Superior Court, in the view of some bankruptcy specialists. Miller, Bostwick, and other bankruptcy specialists said that if the church’s proposed settlement is not acceptable, there is a danger for the archdiocese that the judge might accept a later and more costly proposal put forward by the claimants. Moreover, Bostwick cited claims of serious illness in bankruptcy cases involving asbestos manufacturers as evidence that it is difficult to achieve resolution when the two sides are haggling over placing a monetary value on emotional and physical harm. There is also a perceptual problem. One attorney, who is familiar with the church’s case but uninvolved, said there will be “irretrievable damage” to the church’s reputation if it has to seek protection in bankruptcy court. And it may seriously undercut fund-raising, which has already been severely hurt by the disclosures of clergy sexual abuse of minors. Bankruptcy court would also introduce another requirement that the church may find onerous: Its closely held financial records would be available for public inspection for the first time. If the archdiocese does elect bankruptcy, the filing would be restricted to its principal corporate entity, according to the archdio cesan sources. It would not involve related organizations such as Caritas Christi, which runs the archdiocese’s health-care system, or Catholic Charities, one of the state’s largest providers of social services. Now, however, that prospect is immediate enough that Glosband and a team of lawyers are far along in their legal analysis of the issues and immersed in gathering the facts and the documents the archdiocese would need to file a Chapter 11 petition for bankruptcy protection, according to the sources. Underscoring the seriousness of the preparations, Goodwin Procter has retained the Rasky-Baerlein Group, a Boston public relations firm, to advise the firm on communicating the complexities of a bankruptcy filing to several audiences, including priests, parishioners, and the wider public, according to the sources. Separately, the firm has a longstanding relationship with the archdiocese: It has contracts with both Catholic Charities and Caritas Christi. Under federal law, Chapter 11 filings are intended to gather all of the debtor’s creditors under one roof with an equal chance at recovering what is due them, while also allowing the debtor to make a new, and unencumbered, start after the bankruptcy case is settled. During the Chapter 11 process, the church would continue to administer its own affairs, though not without possible oversight by the court. According to the sources, and one of the cardinal’s advisers, church officials have become more pessimistic about the prospects for resolving the claims through mediation. According to the adviser, the archdiocese’s rancorous relationship with the Greenberg Traurig law firm is one factor in the gloomy outlook. In addition, the prospect of having a US bankruptcy judge take charge became more attractive last week when Suffolk Superior Court Judge Constance M. Sweeney, who has oversight of all the cases, issued an opinion that the archdiocese believes shows she is biased against the church, an adviser to the cardinal said. In a ruling on a subsidiary issue, Sweeney wrote that, contrary to Law’s sworn testimony, the church’s records contain evidence that some abusive priests were sent to new parishes despite suspicions that they were continuing to molest children. The cardinal’s adviser said he and others were troubled by what they perceive as Sweeney’s animus, noting that she has said she will preside at any of the cases that may go to trial. The conclusion she reached in last week’s opinion, the adviser said, is one that should be reached only by a jury. The events that brought Glosband into the case began last spring. At the time, the archdiocese was surprised by an avalanche of new claims against priests prompted by public disclosures that began in January. With the number of fresh claims at that time approaching 200, the archdiocese backed out of a tentative agreement that would have paid $20 million to $30 million to 86 people with existing claims involving abuse by defrocked priest John J. Geoghan. In August, those 86 people settled for $10 million. Now that the number of new claims has doubled again, even as hopes for a settlement have lessened, the archdiocese felt it had no choice but to prepare a bankruptcy filing, according to the archdiocesan sources. Bankruptcy filings by charitable organizations are rare. And such a step by the church is without precedent. In 1997, the Dallas diocese received permission from the Vatican to file for bankruptcy after a jury awarded $119.6 million to several victims of one priest. The diocese never filed, but the threat alone prompted the victims to settle for $31 million. Law, according to the sources, has not yet asked for the Vatican’s permission, but expects that the Vatican would rule quickly. Without a settlement, and without a bankruptcy filing, the archdiocese faces protracted litigation. And much of its substantial legal costs would drain funds from insurance coverage that might otherwise go to victims, according to one of the sources. The same source also expressed concern that a jury trial might prompt a judgment so large that other victims would be left with little chance to receive settlements of any size. The archdiocese is so cash poor that it recently mortgaged its offices and Law’s residence to raise funds for operating costs, but it owns real estate with an assessed value of more than $1.3 billion, according to a Globe review of real estate records. The actual value is believed to be much higher. Several bankruptcy specialists said there is no legal protection for those assets in bankruptcy court. The church sources, however, said the overwhelming majority of the real estate is operated by the 362 parishes in the archdiocese. They said Glosband has a strong legal argument that those properties are owned by the archdiocese in trust for the parishes and, therefore, cannot be sold to satisfy claims. But the bankruptcy process, with its emphasis on negotiation, would give the archdiocese the incentive to make an offer that is acceptable to the pool of claimants. For the judge to accept a resolution, it must be approved by a majority of the claimants, and those voting in approval must represent at least two-thirds of the amount claimed. If the archdiocese does file for bankruptcy, it would have 120 days to submit a plan. But as a practical matter, according to bankruptcy lawyers and the church sources, the filing itself would probably push both sides to the negotiating table right away. By all accounts, including those of the archdiocesan sources, the church will have to come up with substantial funds of its own if the claims are to be resolved - in mediation or, if it comes to it, bankruptcy court. The issue is: How much will the church pay, and how much will its insurers contribute? Right now, Kemper and Travelers, the two insurance companies that provided liability coverage from 1977 to 1989, are arguing that their liability for acts of abuse that occurred during those years is limited to little more than $20 million for both companies, according to attorneys for both sides. The archdiocese, however, insists that there is more than $60 million in remaining coverage. Herbert Weinberg, a bankruptcy attorney, said any insurance dispute would probably be resolved by the bankruptcy judge. In Chapter 11 proceedings, Weinberg said, judges “are loath to let insurance companies walk away with potential assets” without evidence that the debtor engaged in fraud. However that issue is resolved, the archdiocese will have to contribute a large amount to any settlement. Officials familiar with the church’s finances say that in the most likely scenario, the archdiocese will have to sell property. The most likely parcel: the 16-acre site in Brighton of the chancery and Law’s mansion - which Boston College wants to buy. By the reckoning of the archdiocesan attorneys, there is the possibility that a bankruptcy judge might limit the fees of the plaintiff attorneys. For instance, if the cases were to be settled through mediation for $90 million, lawyers for the victims would receive at least $30 million of that. In three corporate bankruptcies prompted by personal injury claims, according to the archdiocesan sources, judges held legal fees well below the one-third or more that is typical in contingency fee arrangements. Those cases involved breast implants manufactured by Dow Corning, Dalkon Shield claims against A. H. Robins Co., and a Vermont asbestos manufacturer. Bankruptcy law specialists said there would be another incentive for the parties to reach agreement in bankruptcy court. Without an agreement, both sides would be back where they started, with Judge Sweeney regaining jurisdiction over the claims. Walter Robinson’s e-mail address is wrobinson@globe.com. Stephen Kurkjian can be reached at kurkjian@globe.com.